As public services face increasing challenges in the face of economic, social and demographic pressures how do we improve lives effectively? Evidence informed policy and practice will be key. Stimulated by debates at a roundtable discussion with senior stakeholders from academia, the third sector and government this paper examines the particular public policy context in Scotland and implications for evidence use and generation. 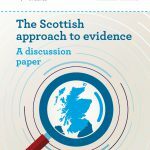 It argues that cross sectoral stakeholders in Scotland have the opportunity to develop an expertise on evidence effective participative policy making and that there is much to share and learn across borders where similar shifts in policy are taking place. Find out more about our evidence into policy work here.